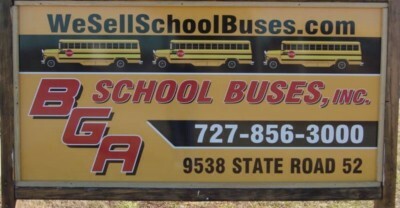 We are a used school bus dealer located 30 miles north of Tampa, Florida. We have a large selection of used buses in stock at our sales lot. We offer nationwide delivery on every used school bus we sell. We are working on the road most of the time, and it is hard to take notes and follow up with you on the phone. You are more than welcome to call 727-856-3000 if you wish to call us. Thank you. In order to receive the cash price, the bus must paid for in full within 7 days. Please call before driving out to our lot. We have a very small staff, and sometimes everyone is working on the road. If you make an appointment, this ensures someone will be at the lot to meet you. ** Early bird prices are the price of the bus before it gets to FL. You have to pick the bus up at it's current location for that price. If you want the bus delivered, we figure mileage from where the bus is located. There is a $25 wire fee for all wires received. Thank you for scrolling all the way down the page.